Designers have a lot on their plates. Defining information architecture, building prototypes, delivering designs on spec… Wouldn’t it be great if there was a tool that gathered all your designs, prototypes and feedback in one place? Ahem ahem. Here at Justinmind, we work on giving you exactly that. We believe that a collaborative design process can boost your design team’s productivity, avoid errors and help build better products. In this post we’ll explore the benefits of collaborative prototyping within an integrated design workflow. Plus, we’ll show you how you can design, prototype and gather feedback all in one design tool, Justinmind. When it comes to web and app design, two heads are better than one. In fact, the best products are created when teams come together from the very beginning. Take IBM for example, where design collaboration has helped teams boost productivity, improve quality and accelerate project delivery. Remember, teams that work together learn together. So you get it, design collaboration is important. But how do you go about encouraging collaboration in your design workflow? The key is in the tool you use. 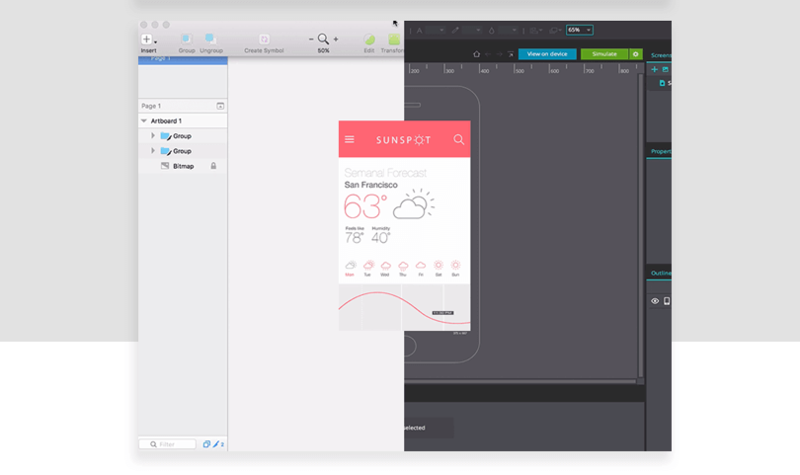 If you’re not already, you should be using a prototyping tool. Apart from the great collaboration benefits, prototypes help you visualize your designs in real-time and are a foolproof way of upping your UX-game. Now back to those collaboration benefits. Collaborative prototyping is a great way to encourage togetherness in the design process. From definition to delivery, online collaboration tools that support integrated workflows make it easier and faster for designers to stay in sync, gather meaningful feedback and ensure design quality. No wonder prototypes are among the top UX deliverables! Not all prototyping tools are made equal. Justinmind is one of the best wireframing and prototyping tools for designers and is integrated with a ton of other design resources – including Sketch, Photoshop and Atlassian JIRA. These integrations not only make it easier for you to collaborate with your colleagues, they also give you the freedom to combine your favorite tools within the same workflow. Let’s take a look at some of these integrations. Get the Justinmind Sketch plugin here. Justinmind’s integration with Adobe Suite lets you work across both Photoshop and Illustrator. The Adobe Suite is used by designers to build and refine UI assets incorporating them in a prototype or mockup. But sometimes designs need tweaking. Our integration allows designers to go back and forth between Adobe and Justinmind and make sure they’re 100% happy with the visuals before moving forward with the interaction. This integration will save you and your team time, avoid rework and ensure that your designs remain consistent, no matter what tool you’re working in. We think that collaboration should be intuitive and fluid. Justinmind’s integration with Atlassian JIRA is the key to organizing your design process and making sure that everyone is always on the same page. With this integration, you can manage your team’s workflow, visualize prototype tasks in your project backlog and consolidate requirements across both platforms. Hunting for design instructions can be a real waste of time. But with Justinmind, you can link your JIRA requirements to UI elements in Justinmind and get to work in no time. Plus, you can export any changes back to JIRA just as easily and get 360 degree contextual information on your designs directly in your project backlog. Don’t ever get lost in translation again! Get the Justinmind for JIRA add-on here. Justinmind’s integration with IBM Rational DOORS is the ideal solution when working with reviewers. 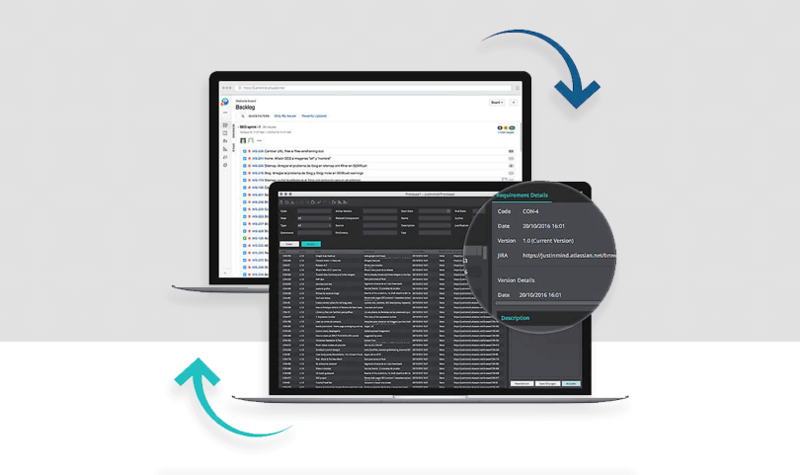 Capture, trace, analyze and manage requirements for the entire web project. Import IBM requirements into Justinmind and share your prototype with reviewers. They will be able to visualize the requirements directly and leave you feedback with Justinmind’s Comments feature. This integration enables you to engage your stakeholders continuously and help them understand your vision, every time. Then, share your prototype with your team and stakeholders to complete the product definition process. They can even view your updates directly in TFS! Get the TFS plugin here. And last but not least, we’d like to tell you about our usability testing tool integrations. Justinmind is integrated with all leading user and usability testing tools. Remember, a good design can only be great when tested to ensure it’s both accessible and enjoyable to use. With Justinmind’s testing tool integrations, you’re in control. Choose your tool, your users and how you’d like to perform the tests (qualitative or quantative). You’ll have your results returned quickly so you can get to work on implementing that all-important feedback. Read more about our usability testing integrations here. Collaborative design is the best way to build awesome products. Justinmind is one of the top collaborative prototyping tools – ideal for an integrated design workflow. Download it now to take advantage of our integrations and make your design process smoother than ever.